From Fredric March in “Death Takes a Holiday” to Brad Pitt in “Meet Joe Black,” the idea of a handsome figure representing Death has had immense appeal in the movies. Perhaps the most dashing Grim Reaper of them all is the one played by Taiwanese-Japanese heartthrob Takeshi Kaneshiro (“Chungking Express,” “Fallen Angels”) in Masaya Kakei’s “Accuracy of Death,” a humorous, wistful film that is built around the wryly melancholic leading-man demeanor of its star. Based on an novel by Kotaro Isaka, “Accuracy of Death” employs a tripartite structure that focuses, in turn, on three of Chiba’s “clients”: Kazue (Manami Konishi, from “Retribution” and “Udon”), a painfully shy, withdrawn customer service agent plagued by a possible stalker; Fujita (Ken Mitsuishi), a yakuza out to revenge his friend’s death who is about to be betrayed by his superiors; and a 70-year-old hairdresser (Sumiko Fuji, star of the “Red Peony Gambler” classic film series in which she portrayed a female yakuza), who is regretful over the son she abandoned. These three interconnected stories make great emotional impact upon our hero, a figure who brings rain with him everywhere he goes, and has never seen the sunshine or a blue sky. He finds solace to his, pardon the pun, grim profession by the great joy he gets in listening to music. 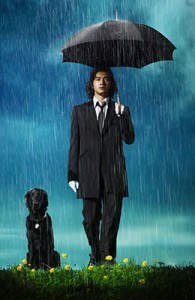 His closest companion, in the film’s most bizarre trope, is a wisecracking dog with whom Chiba communicates telegraphically. In lesser hands, such a scenario would be a wispy, contrived affair. However, Kakei transforms this potentially pitfall-prone material into something far more substantial and astute. The film’s great sense of humanism – and its insight into the pain and regret that is an unavoidable ingredient of most our lives – form a poignant undertow to the film’s comic surface. The three clients’ stories told converge in unexpected ways, reinforcing the film’s themes of human interconnectedness in a very funny and moving fashion. And it is all held together by the presence of its lonely main figure, who until the film’s conclusion is an observer of life, but never a true participant. “What do you think about death?” is the question he asks of each of his clients, but it seems he is really asking himself. Chiba, who wears white gloves so as not to touch anyone (people turn gray and collapse at his touch), is an amused and amusing, yet often bewildered, observer of those he must judge as ready for the afterlife. As beautifully embodied by Takeshi Kaneshiro’s portrayal, Chiba seems to skirt the very edge of despair, yet at the conclusion begins to fully appreciate the true meaning of his métier. “Accuracy of Death” screens July 3 and 4 as part of the New York Asian Film Festival and the Japan Cuts Festival of New Japanese Film. For ticket information, go to the Subway Cinema Web site.